Week 6 of the Blog Hop is here! I can't believe 6 weeks have already passed and the hop is almost over. 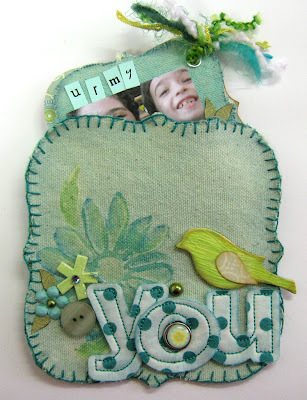 I love mini albums, so I was very excited to play around with Brenda Pinnick's Album, Brackets XL Die. I got paper and canvas pieces which made it even more fun. What made my happy feeling complete was the fact that the idea I had for the mini album solved a problem for me. When I put photos of my kids in my purse they always get lost and if I put them in a mini album it doesn't stay whole for a long time because of all the stuff I have in the purse. This mini is perfect for that because it has a bag of its own! I took the two large canvas pieces, sewed them together and made a little special bag to put my mini album in. then I made the pages of the mini from the smaller canvas and paper pieces. I used a lot of fun techniques in this project, so I included a tutorial in the post so you can try them too. Rhinestones, pearls: Queen & Co.
1. Faux Batik on Canvas technique: spread Gloss Multi-Medium onto non-stick craft sheet. Stamp with the foam stamp into the multi-medium and then stamp the canvas. Let dry. Brush a watery paint mixture on top. After the canvas is dry add more colors to the stamp. 2. Sew the two pieces of the bag together leaving the top open. You can extend the sewing on the top side, but only on the front piece. 3. Color Change technique (optional): I changed the color of the chipboard bird to match the color scheme. Paint embellishment with Gesso. Let dry. Paint over the gesso with acrylic paint. Let dry. 4. 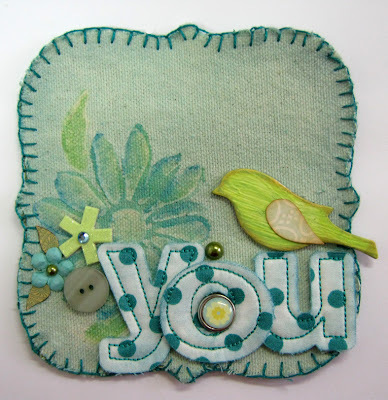 Add fabric letters and embellishments. 1. Wash paint technique: brush a watery mixture of two colors on the fabric pieces. Let dry. Ink the edges. 2. Shaped pages technique: trace the shape of the canvas pieces onto patterned paper. Cut accordingly. 3. Add photo to each page. 4. Add title to each page. 5. Cut outs technique: create your own cut outs by cutting patterns and shapes from patterned papers. 6. Embellish the pages with buttons, rhinestones and lace. 7. Add eyelets to all the pages and tie with strings. 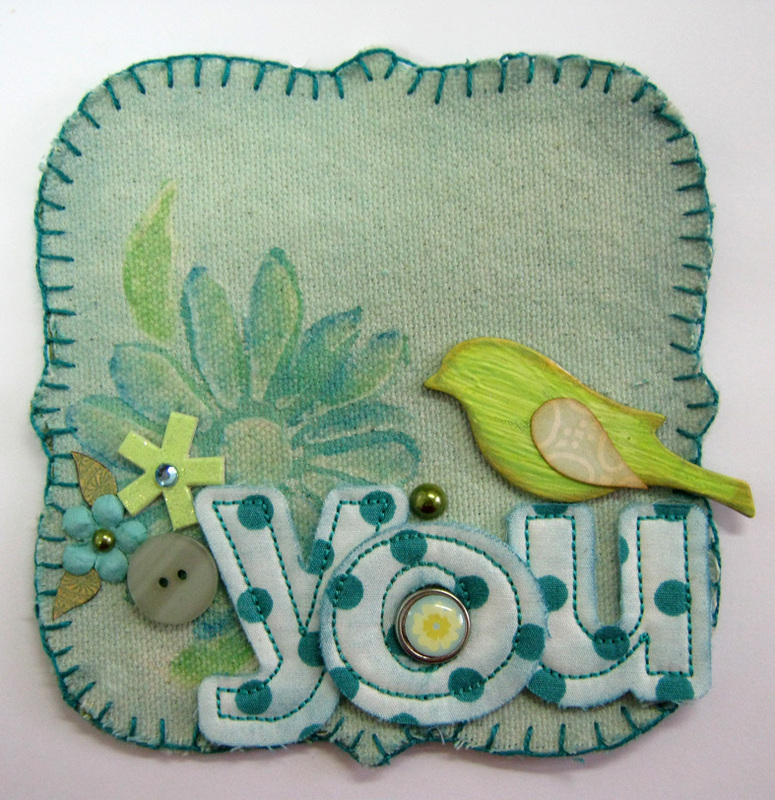 Keep hopping to see all the wonderful creations made by the other designers in the blog Hop. Einat, absolutely everything about this project is stunning. I love the idea, the colors, the techniques, the photos - everything!!! such beautiful soft colors - gorgeous. Wow, there is so much to learn from just this one project! Fabulous! Einat, your mini album is just beautiful! I love all the stitching and techniques you used to make it. Einat, your album is just delicious! What a fun and creative way to carry pictures of your kids around with you to show off to friends! Thank you for using my dies! This is totally awesome!!!!!! I love all the different textures in your album... and I am with you! I can't believe it's almost over! EEPS! Einat - Love your color combination and the cover is fantastic! WOW Einat this is fantastic! This is a great gift idea and the fabric will hold up better than paper. This is so pretty! Love the fabric choices! Love the colors and the textures and all the wonderful details you've included! Fantastic! Einat, there is so much beauty in this project. 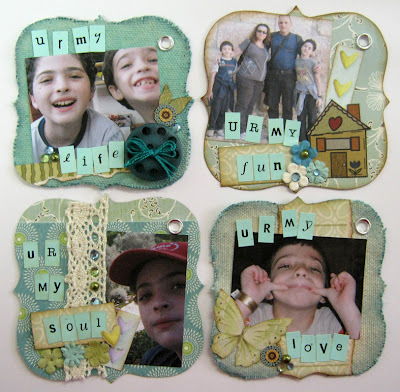 I love the idea of keeping the kids pictures together-truly a labor of love. 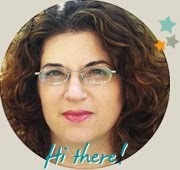 Einat, your work is astounding! Love this. Love the stitching. Awesomeness! Einat, your album is fabulous and a work of art! This is beautiful! So inventive to make an album purse with the larger pieces! That is so gorgeous! Great job! This album is a perfect use of the die, great use of color and techniques!